¶ 1 Leave a comment on paragraph 1 0 Figure 1. A censored page from volume 1 of Conrad Gesner’s History of Animals (Zurich, 1551) with the author’s name transformed. Image courtesy of the Department of Special Collections, Stanford University Libraries. ¶ 3 Leave a comment on paragraph 3 0 Figure 2. An expurgated copy of Leonhart Fuchs’s commentary on Galen (Tubingen, 1541) with Fuchs’s name transformed. Image courtesy of The New York Academy of Medicine Library. ¶ 5 Leave a comment on paragraph 5 0 The above images are taken from copies of sixteenth-century books of natural history and medicine. However, at a glance, it is difficult to identify who wrote these texts. The letters of the authors’ names have been transformed with pen and ink into a jumble of nonsense characters. From Conrad Gesner’s name above the image of the moose to Leonhart Fuchs’s name above his commentary on Galen, these books bear witness to the practice of ecclesiastical censorship in sixteenth- and seventeenth-century Italy. By juxtaposing individual, censored objects from different library collections, we can analyze expurgated books as an archive of practice that documents and reveals the historical practices and material processes of censorship. ¶ 6 Leave a comment on paragraph 6 0 Following the Reformation, Catholic authorities in Paris, Louvain, Portugal, Spain, and a number of Italian cities published Indexes of Prohibited Books, lists of texts that Catholics could not read. These prohibitions established that while the works of some authors, like Martin Luther or John Calvin, needed to be burned, other works, including Gesner’s History of Animals, were instead deemed worthy of expurgation, a practice that Catholic authorities regularly referred to as “correction.” Instead of destroying the whole book, some parts of the text were removed, and the rest was allowed to remain.1 Expurgation was a form of Catholic compromise, allowing prohibited books to continue to exist in an altered form. This compromise created enormous intellectual, legal, and logistical hurdles for local inquisitions and, in Rome, for the Congregation of the Index of Prohibited Books. Expurgation also created a project for book owners, book sellers, bishops, and local inquisitors who were responsible for physically altering books to comply with the ever-shifting rules about which parts of them were allowed. These readers and churchmen took on the project of expurgation with pens, blades, paper, and glue. The corrected, expurgated books, like the examples shown above, are repositories of information about how they were used and altered to comply with ecclesiastical decrees. These two examples are striking in the similarity of their approaches, but books were expurgated in a variety of ways that have left a range of physical evidence within their pages. 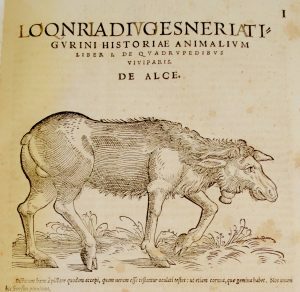 ¶ 9 Leave a comment on paragraph 9 0 The image shown above of the moose is one of many illustrations of quadrupeds in the first volume of Conrad Gesner’s History of Animals (1551). Before the manuscript addition, the headline of the page originally read “Conradi Gesneri Tigurini.” Yet, the inked addition to the text was actually a deletion in this case. By obscuring the printed name it effectively removed the author’s name from the work, a practice required across the Italian peninsula after the Pauline Index of Prohibited Books banned Gesner’s books in 1559.7 Books written or edited by Leonhart Fuchs were also banned in 1559, including the copy shown here of Fuchs’s commentaries on the ancient physician Galen of Pergamon’s On Maintaining Health. A reader censored Fuchs’s name, transforming the letters so that “Leonharti Fuchsii” was no longer legible. ¶ 10 Leave a comment on paragraph 10 0 While the Fuchs edition contains the transformations of his name without further comment, the copy of Gesner’s History of Animals reveals additional clues about how and why it was censored. On the flyleaf, an inscription details the owner’s justification for keeping the prohibited book.8 In a small, neat script that matches the hand and ink of the expurgations and the marginalia throughout the volume, the owner explains, “Without danger of anathema this book on the history of animals … can be read. According to the mandate of the Reverend Inquisitor of Pisa, Magister Lelio de’ Medici…” The mention of Lelio de’ Medici, the Franciscan Inquisitor of Pisa from 1586-1603, allows us to date and contextualize the expurgations enacted on this volume. The period of de’ Medici’s appointment in Pisa coincided with the Roman Congregation of the Index’s edict that local experts in Pisa take the lead in correcting books of medicine and philosophy written by heretics.9 Gesner’s name was not the only part of the text that the dutiful Catholic reader altered. Names of other heretics, like Desiderius Erasmus and Martin Luther, have been “expunged and erased” from the pages. The owner of this book also indicated differences between Biblical quotations provided by the Zwinglian Gesner and the Catholic Vulgate edition of the Bible. By changing the characters in Gesner’s name and obscuring other names and passages throughout the book, the parts of the text that Catholic readers should not see were deleted. ¶ 11 Leave a comment on paragraph 11 0 There is no evidence that the same person who expurgated Gesner’s book under the direction of Lelio de’ Medici also expurgated Fuchs’s text, and while the practice of transforming letters in the names of heretics was unusual, these two examples are not unique. I have identified additional copies expurgated in this method that are currently held in libraries in Genoa, Padua, Rome, and the Vatican.10 While each expurgated book contains particular information about how it was used and handled, examining multiple copies can help to establish what kinds of practices were commonplace and which examples are historically surprising. As scholars, we must take the opportunity both to read deeply into individual copies and to bring together many examples of expurgated texts to constitute an archive of practice. ¶ 12 Leave a comment on paragraph 12 0 Looking at multiple copies of the same book is hardly a new research methodology; descriptive bibliographies and censuses of books have done this work for many years. In the most innovative of examples, scholars treat all of the copies of an edition as a starting point not for establishing an ur-text, but as an opportunity to trace interrelated readers’ marks, wandering provenances, and the people that shaped the objects before us today.11 My research takes this approach a step further by bringing together expurgated books as an archive of practice, alongside the better-known archives of inquisition trial documents, official edicts, and even parish-level records. 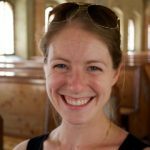 If we treat the interventions into books themselves as a unifying and organizing characteristic that constitutes an archive, we can consider the ways that archives both exist within and might also transcend time and space. ¶ 15 Leave a comment on paragraph 15 0 However, in the case of expurgated books, assembling the archive is not a straightforward process. Tracing provenance can provide some clues for identifying expurgated books. Books that spent the sixteenth and seventeenth centuries in Northern Europe are rarely expurgated, since Northern Europe was predominantly Protestant and there was, therefore, no need to comply with the laws of Catholic censorship. On the other hand, copies of books written by Protestant authors with provenances traceable to early modern Italian libraries are much more likely to bear the signs of censorship. Important collections, like those in the Vatican Library, present something of a quandary. While many of the owners of the book collections there were Catholic, Popes and Cardinals had reading privileges beyond those available to most readers in Italy; the books in these collections may or may not be expurgated.18 Libraries in the United States are a step further removed from the confessional geography of early modern Europe, and finding censored books based on provenance is exponentially complicated by the fact that many of these texts circulated for many years before arriving in their institutional homes. To take the copy of Gesner’s book shown above as an example, we know that it has traveled from where it was printed in Zurich, across the Alps to the home of an early owner in Pisa, and then across the world to the collection of Steven J. Gould, and finally to the library at Stanford. Reassembling these widely dispersed books to create an archive of practice requires digging deeply into the histories and provenances of local collections. ¶ 16 Leave a comment on paragraph 16 0 After identifying a collection likely to hold multiple examples of expurgated books, the next challenge is searching the catalogs. Catalog entries, both online and in card catalogs, only occasionally mention when a book is censored. Without further specification about the type of censorship, the record might indicate that a copy is a reprint of a work that was targeted for correction by Catholic authorities, rather than a book that shows physical signs of expurgation.19 In this case, the work had been censored, rewritten, and reprinted, but the object that has arrived on the library desk is not physically expurgated. ¶ 17 Leave a comment on paragraph 17 0 Since catalogs rarely mention works as “expurgated,” I have been rethinking the ways that censorship has altered texts. The images from works by Gesner and Fuchs might be plausibly listed as “altered in pen” or even more vaguely as containing manuscript additions. To take another example, if large portions of text in a book are blacked out, and if the cataloger does not recognize the intervention as censorship, it might be noted instead as containing “ink damage.” Another way of expurgating a book was to glue blank paper over portions that needed to be hidden from orthodox Catholic eyes. When these books were later sold on the antiquarian book market, dealers would often try to remove the pasted-on pieces of paper, leaving once-expurgated books instead with “water stains” from trying to melt the glue, and more generally causing “damage to title page.” Both phrases occasionally turn up expurgated copies of books in American catalogs. Italian catalogers are especially aware of the long shadow of ecclesiastical censorship in their country, and “frontispizio mutilo,” the Italian equivalent to “damaged title page,” vividly captures the cultural perception of censorship as a defacing, mutilating, or maiming of the page, not just happenstance harm that the object incurred. ¶ 18 Leave a comment on paragraph 18 0 Focusing on the effects of censorship on books also reveals that expurgation causes some pages to go “missing.” In libraries with catalog entries that include collocation formulas for the books in their collections, a note that folios a1-a2 or a2-a3 are missing regularly signals that a book is expurgated. One of the common changes to volumes required by Catholic law was the removal of dedicatory epistles written by Protestant authors or dedications praising Protestant dedicatees. Indeed, the copy of Fuchs’s commentary on Galen at the New York Academy of Medicine is missing *2-*6, the pages that contained the dedication from Fuchs to the abbot of the Zwiefalten Abbey. In books like Cardano’s commentary on Ptolomey’s Quadripartito, a collocation formula missing a folio or two in the middle reveals that the highly problematic horoscope of Jesus Christ was removed from the book.20 Cross referencing expurgatory indexes alongside collocation formulas can reveal why certain pages in particular tend to go missing from books that were prohibited but could be corrected. While early modern censors regularly described removing passages from books as “canceling” them, searching for “canceled” copies in library catalogs returns the bibliographical use of “cancel” that catalogers are familiar with: a leaf removed in the course of printing a book (and often replaced), not a censorial intervention after publication. ¶ 19 Leave a comment on paragraph 19 0 In addition to ink damage, papering over passages, and removing whole pages, parts of books could be covered with gesso, pasted together, and transformed into a jumble of random characters. By looking across this archive of practice we can acknowledge both the individuality of each censor’s interaction with a text and generalize about the common approaches used across many texts. One goal of my research is to establish a typology of the forms of book expurgation by attending to the interventions censors made in hundreds of early modern medical books.21 This work is more than a cataloging intervention: the material practices of early modern censorship reveal the ways that censors and scholars engaged with prohibited books. Expurgation was both a process that required substantial work to determine what material should be expurgated, and a physical task to be executed upon many thousands of prohibited books circulating in Italy. Attention to how prohibited books were physically altered treats these books as an archive that provides insight into the practice of expurgation and the actors involved in book censorship. Additionally, stabilizing the language of expurgation will influence descriptions in catalog records and make these fascinating objects easier to find. Clearer catalog entries would open the door for future research on the material instantiations of censorship and facilitate better communication between scholars and librarians about the physical attributes of these texts. ¶ 21 Leave a comment on paragraph 21 0 I want to invite scholars to use the example of expurgated books to reconsider what it means to be part of an archive or a collection. Expurgated books are not united by their content or provenance, but by their shared, physical experience of censorship. The dispersed archive of expurgated books is an archive of the Catholic inquisitions that was never intended to exist. But bringing these books together has the potential to do more than identify copies of books that sat side by side in libraries 400 years ago.23 More radically, this methodology creates a new archive of texts and objects that share intellectual proximity because of their physical states. These books are by-products of the early modern disputes over religious and intellectual authority, vestiges of the power of early states.24 However, the dispersed archive of expurgated books is a collection that we are convening outside of the exigencies of the early modern era. 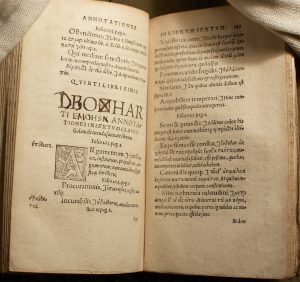 In contrast to national archives, institutional archives, or even the proliferation of personal archives, expurgated books can be studied together as a material archive, an archive of practice.25 Learning to interact with books in ways that complied with a culture of censorship was a skill that early modern scholars mastered, and one we are only now beginning to recover. ¶ 24 Leave a comment on paragraph 24 0 I am grateful to Ryan Kashanipour, Nicole Ferraiolo, and two anonymous readers for their insightful comments that substantially sharpened this essay. I would also like to thank Richard Calis, Caroline Duroselle-Melish, and Roger Gaskell for inspiring conversations and for sharing citations.